Ben Affleck at 60th Annual San Sebastian Film Festival in Spain. 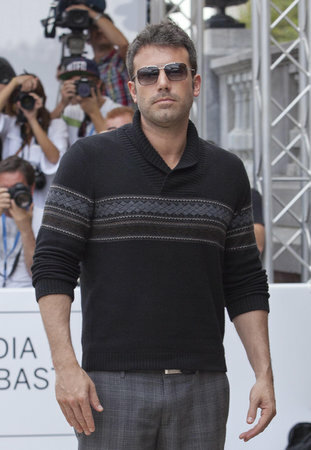 Ben Affleck was in Spain over the weekend for the 60th Annual San Sebastian Film Festival. Ben is currently doing the promotional rounds for his new movie Argo which I can’t wait to see. Based on true events, ARGO chronicles the covert operation to rescue six Americans, which unfolded behind the scenes of the Iran hostage crisis. Ben Affleck has 3 kids with wife Jennifer Garner who just had their first boy Samuel earlier this year. And he admits Jennifer does most of the work caring for their kids. Ben Affleck’s best friend is Matt Damon. The two have been friends for over 25 years and it is no secret they became famous when their script turned movie Good Will Hunting starring Robin Williams was a huge success. Matt recently purchased the house next door to his best friend Ben in Pacific Palisades. Ben Affleck is also the Founder of the Eastern Congo Initiative, a global humanitarian effort to help children around the world live long and healthy lives.